Rivers like Ravi, Yamuna, Satluj, Chenab, Beas, etc. flow through the state. 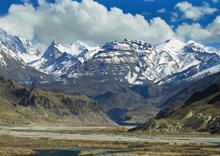 Great Himalaya and Nag Tibba Range are the major mountains in the state. Most of the state is occupied with mountains. The state is rich in natural resources. There are deposits of limestone, gold, copper, rock salt, natural oil, gas, gypsum, brass, etc. in the state. The elevation generally ranges from 450 m to 6,500 m above sea level. Forests occupy about 38 % of the area of Himachal Pradesh. The state has nine different types of soils. They include alluvial soils, brown earths, grey wooded, grey brown podzolic, plansolic and brown hill soils. Most of the areas in the state come under seismic zone IV and V, which means high damage risk zone. Extremely cold weather prevails during mornings and nights in the month of October. The state is one of the most favourite tourist spots in the country. It has a beautiful landscape which surely attracts the tourists. 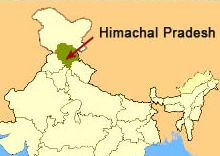 Himachal Pradesh has 49 cities and towns. Smallest among them is Naina Devi and the biggest one is Shimla.